Let’s face it – one trip up and down the baby aisles at Target can be pretty darn overwhelming. There are millions of baby products out there and it’s hard to know what you *really* need. 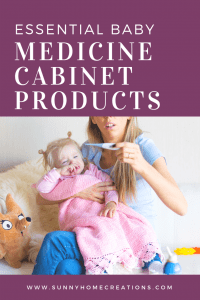 Bringing a new baby home is stressful enough, so let’s take away some of the stress and the mystery behind the products you really need to keep on hand for your baby’s medicine cabinet. The best part? You don’t even need to leave your house to get your hands on this stuff! The Nose Frida. Yes yes, I know. The idea of sucking your precious new baby’s snot out of its nose with your mouth sounds appalling. However, the Nose Frida is actually a totally hygienic way to gently clear out their little noses. No, you don’t end up with snot in your mouth – there’s a simple yet effective filter system that keeps those boogies where they belong (both out of your mouth *and* out of your baby’s nose!). I have not found a better way to suction baby’s nose other than using one of these. And when your baby is all congested up, all you want is to make sure your little one can breathe easily. Don’t forget to pick up some extra filters. It is so hard for your baby to breathe and breastfeed at the same time when they can’t breathe through their nose. If you bottle feed, I would imagine the frustration is the same with your little one. That’s right, another nose product! This one is a gentle saline spray to help moisten your little one’s nose and loosen up stubborn congestion before using the Nose Frida. You can also use this to help flush that congestion right out! Truly a must-have. Okay, I promise this is the last nose-related product on this list, but trust me when I say that babies’ tiny noses are really sensitive! Use these Boogie Wipes in place of tissues to gently clean up their snouts and to wipe up after using Boogie Mist and the Nose Frida. One thing you’ll discover very quickly is how little control infants have over their appendages. Because of that, babies end up scratching at their face quite a bit. Nip those scratches in the bud by using a pair of infant nail clippers like this perfect pair from Safety 1st. Yes, clipping an infant’s nails is terrifying at first – those nails are just so papery thin and tiny! – but the soft grip on these clippers ensure a steady grip and take some (if not all) of that terror away. Brought to you by the same geniuses who created the NoseFrida, this silicone brush is the perfect gentle brush for baby. If your baby ends up with cradle cap, this brush will be imperative to help loosen those stubborn flakes! Pro tip: to help battle stubborn cradle cap, massage your infant’s scalp with coconut oil and let it sit for about 10 minutes. Then, gently brush their scalp in a circular motion while you loosen the flakes. Finally, give that kiddo a bath and wash their hair with a gentle, natural shampoo. Which leads me to our next item! This Burt’s Bees shampoo is gentle on baby’s skin and has an EWG rating of 1, which means it is one of the safest, most non-toxic products for your baby. Gentle enough to use daily (although most babies don’t need to be bathed that often! ), this shampoo has a fresh, clean scent that will leave your little one’s skin soft, cleansed, and smelling delicious! Gripe Water is one of those magical natural remedies that every infant-parent should have in their medicine chest. It helps soothe baby’s tummy and alleviate things like gas, colic, hiccups, and more. I especially love the Little Remedies formula because it’s free of artificial flavors, dyes, sodium bicarbonate, parabens, and gluten. I personally don’t give my children Tylenol and will very rarely give them Motrin/Ibuprofen. 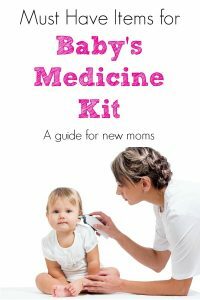 Please consult with your pediatrician if your baby is younger than 6 months of age before giving them any medicine. There has been some information released about Tylenol’s safety and our pediatrician does not recommend Tylenol anymore. Here is an article about how you aren’t supposed to give babies Tylenol. On the rare occasion that I do give my children Motrin/Ibuprofen, I make sure it is dye-free. Most of the time it is the knock-off from Up and Up brand at Target because they have better ingredients (or maybe lack of so many of the bad ingredients is a better way to put it) compared to other brands. I do try to keep at least one bottle of this in my medicine cabinet and I try to make sure it is always in date, which does mean throwing it out when it expires and purchasing new since we don’t use it much. This is really important to have on hand in case your child has an allergic reaction. I personally make sure it is a dye-free version of Benadryl (my kids all react strongly to artificial dyes) or the UP and Up dye-free knockoff of Benadryl. Make sure to talk to your doctor about what the appropriate dosage is for your child. Changing diapers should be an Olympic sport, and applying diaper rash cream is basically tantamount to riding a bucking bronco. Many of the diaper rash ointments and creams out there have chemicals that I don’t want on my baby, this Earth Mama organic diaper balm keeps all the bad stuff out and all the good stuff in. It’s incredibly soothing your little one’s red, painful rash and does a great job creating a barrier to keep the urine off the rash. 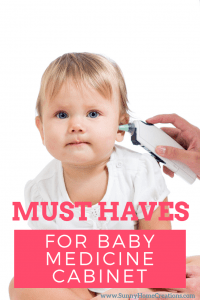 I’ve taken temperatures on my kids using all the different thermometers – rectal, arm pit, forehead thermometer and the ear thermometer. By far I much prefer the ear thermometer. I have found it quick, easy and fairly painless. My middle son had a LOT of ear infections as a baby. Our pediatrician recommended that we try garlic drops in his ear before giving him antibiotics. We found garlic drop to be incredibly effective as long as we used these on him as soon as he said anything about his ear hurting or if I noticed him pulling on his ear. We always keep garlic drops in our medicine cabinet now. We used a baltic amber teething necklace and I swear it made a difference when my kids were teething. When they were wearing their teething necklaces they weren’t as fussy and in general seemed calmer and happier. We bought all of our through Inspired by Finn. With my oldest son we started out using Orajel and it was a pain to apply to his gums. My husband put the Orajel onto his own gums to see why our son wasn’t liking it at all and said it was awful! He said the sensation he had after he applied it to his gums was scary. After that we decided we needed to use something different for the teething pain my son had. That was when we started using the teething necklace and we also tried the Hyland’s teething pills. This was back when Hylands also included belladonna as one of the ingredients. I researched it a ton and decided we were comfortable using them on my son. These Hyland teething pills do not contain belladonna, but will still help your baby out with teething discomfort. When your child is congested up, you’ll do anything to help them breathe easier. Luckily, a humidifier is great way to help clear some of the congestion. I don’t know about you, but it seems like the humidifiers are hard to keep clean and if you don’t clean them regularly they grow mold quickly. This humidifier is super easy to clean to avoid that issue. 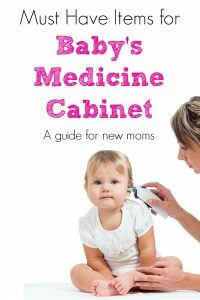 So, there you have it – my top must-haves to keep on hand in your baby’s medicine cabinet. Have I missed anything you swear by? Let me know! Previous Post: « Decluttering Tips – 50 Items to Get Rid Of Today!